Virtual New Zealand Stamps: 1987 New Zealand Post Vesting Day. Government services in New Zealand went through some enormous changes in 1987. One of the most significant of these changes saw the New Zealand Post Office split into three State-Owned Enterprises to separately handle the postal and agency, Telecom and the banking businesses of the former Government Department. New Zealand Post Limited formally took over the administration of the postal and agency functions from the New Zealand Post Office. 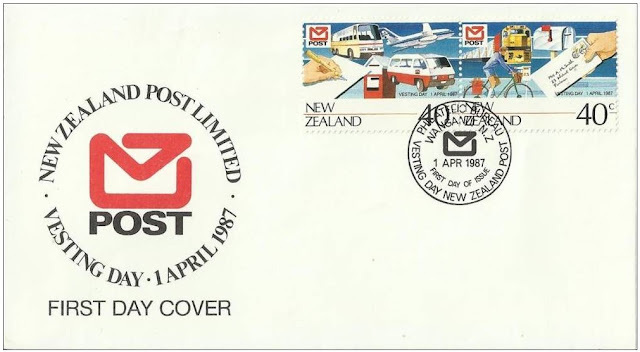 To mark the occasion of the establishment of New Zealand Post Limited, a set of two stamps were issued. 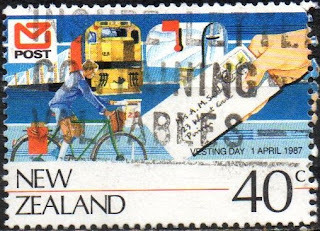 2 x 40c - New Zealand Post. 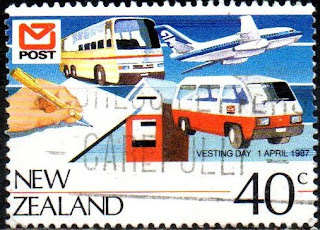 Two 40 cent se-tenant stamps depicted various elements of postal business from acceptance to delivery including bus, aeroplane, delivery van, postbox and handwritten pad - together with the new corporate logo. When these two stamps are placed together, they tell a story of mail service within New Zealand. 40c - Mail Writing, Posting and Transport. 40c - Mail Transport / Delivery / Receipt. This is a Plate Block of 6 se-tenant pairs of stamps. 12 x 40c stamps in all. First Day Cover - 1 April 1987.